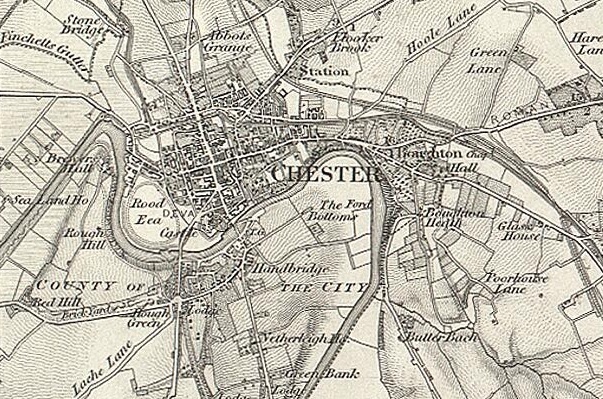 Although unofficial races were held before 1511, it was in 1539 that the Mayor of Chester, Henry Gee, gave permission for races to be held in the city on Thursday 9th February 1539, and he will forever be remembered when people talk about 'going to the gee gee's'. 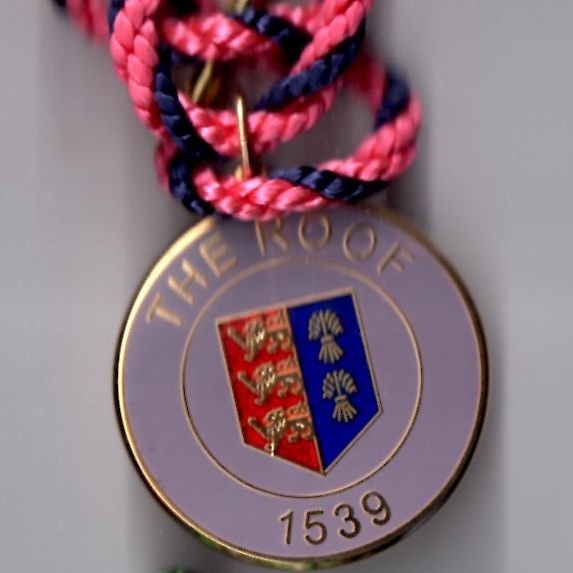 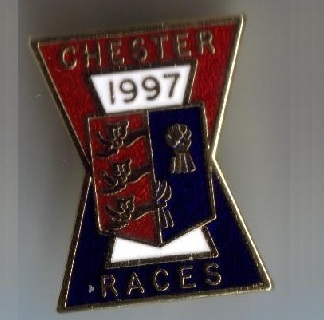 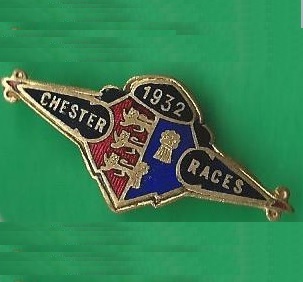 Chester’s Roodee course is by far the oldest in England, with one of the earliest recorded meetings taking place on Shrove Tuesday while Henry VIII was still on the throne. 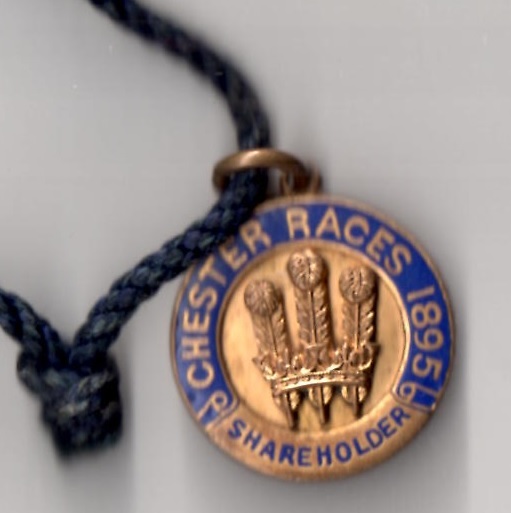 The course was, at that time, known as the Roode Eye and a special silver bell, costing 3s.4d, was given as a prize to the winner of the race. 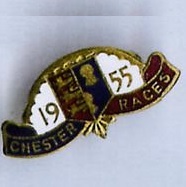 A feature of Chester races, even to this day, is that racegoers and horses walk to the racecourse through the city. 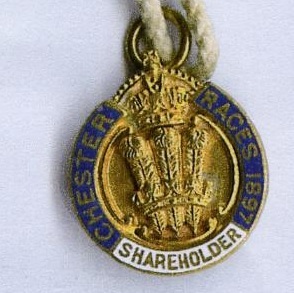 In 1610 the former Sheriff of Chester, Robert Amory, established the St George’s Bells race, with 3 bells of differing values given as prizes. 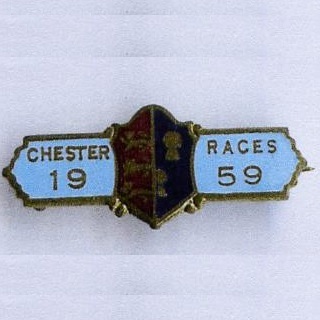 The race passed through the New Tower and up Watergate, a route followed by many horses and punters today. 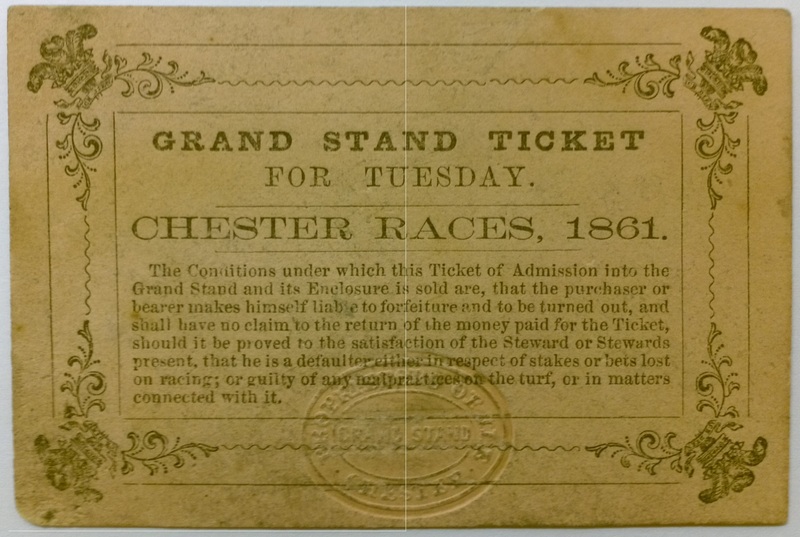 A new law was passed in 1740, during the reign of George II, which decreed that horse races could not be run for less than £50. 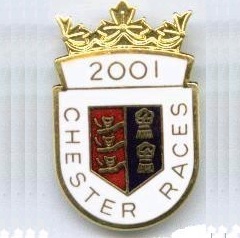 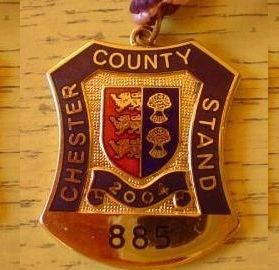 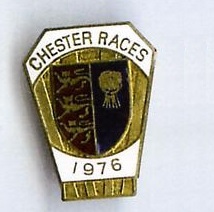 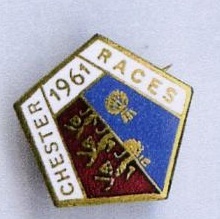 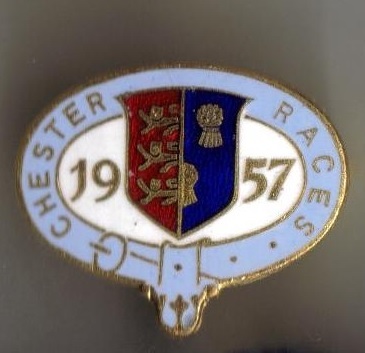 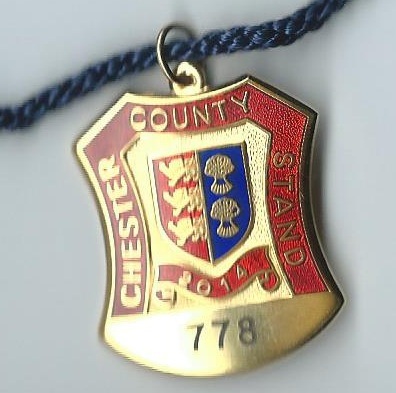 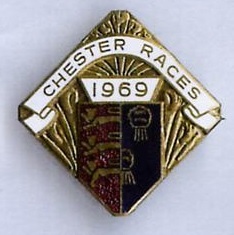 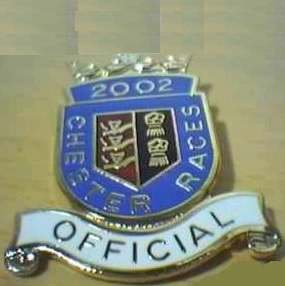 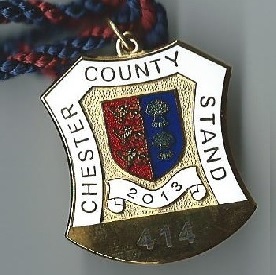 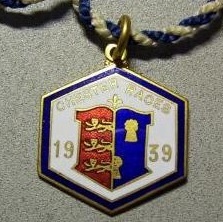 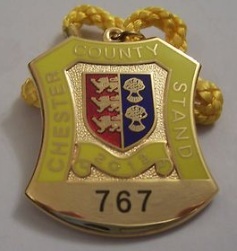 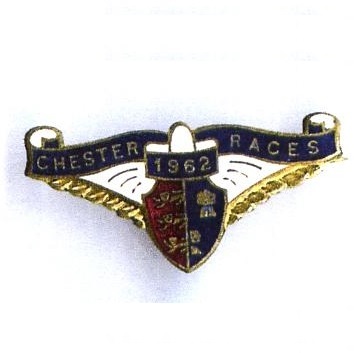 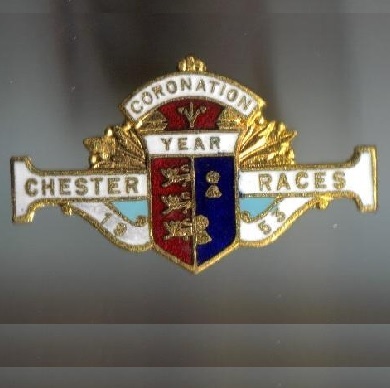 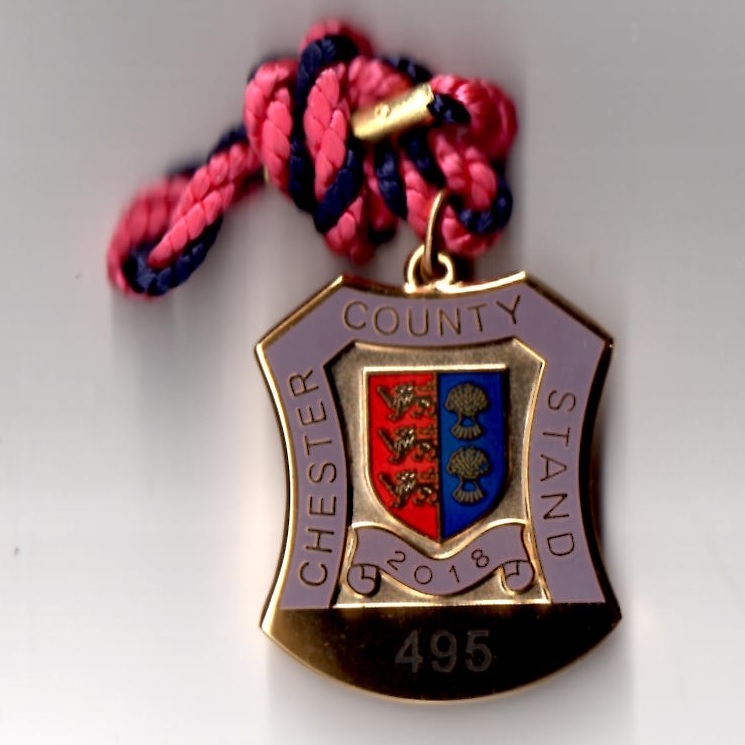 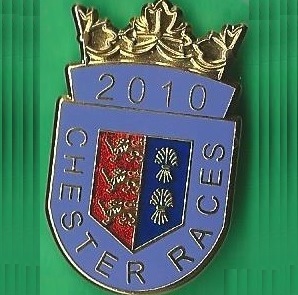 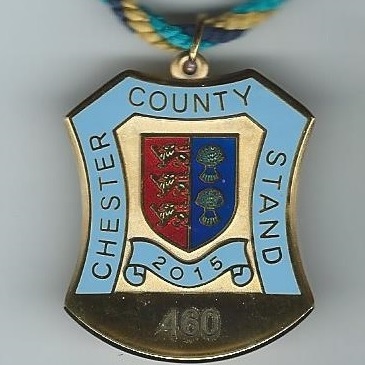 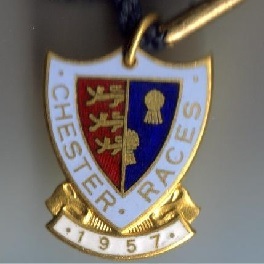 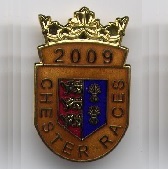 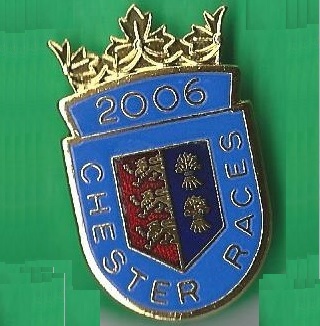 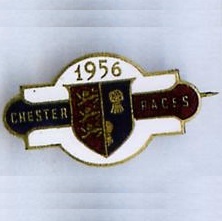 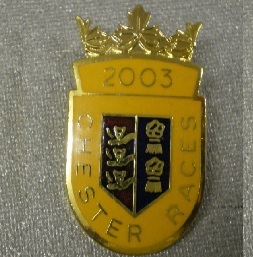 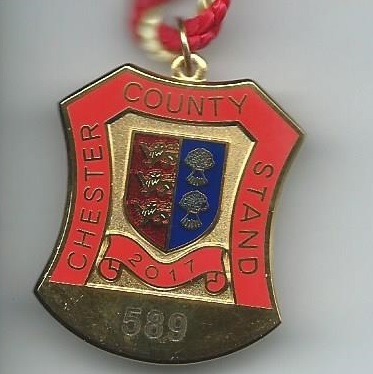 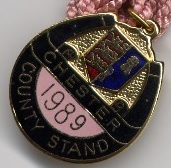 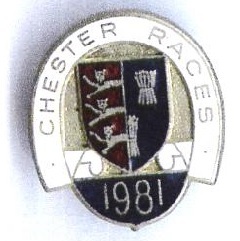 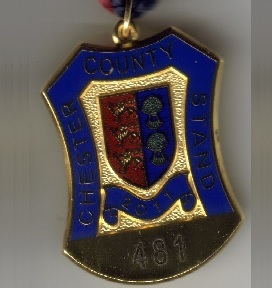 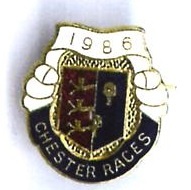 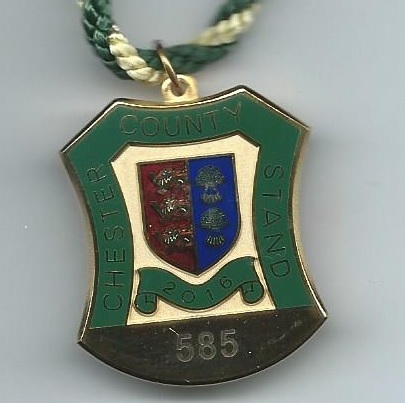 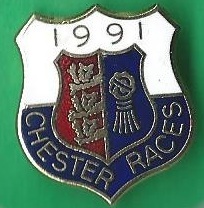 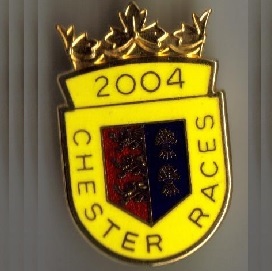 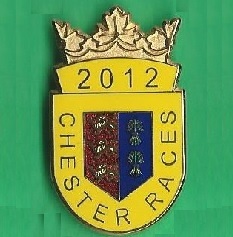 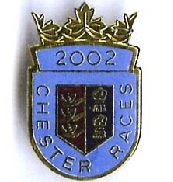 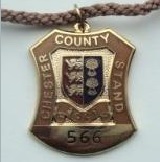 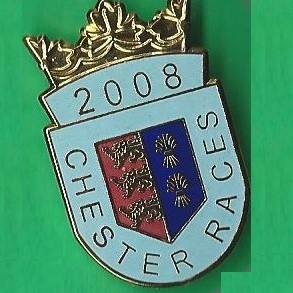 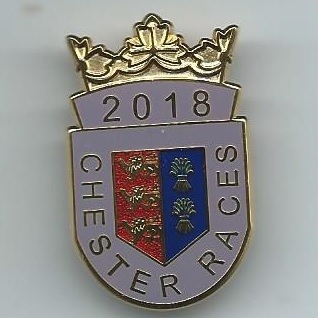 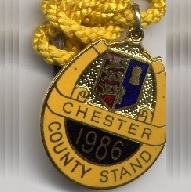 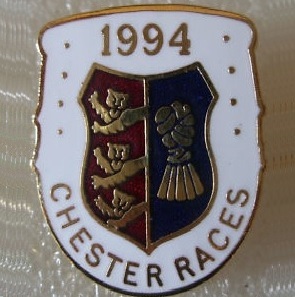 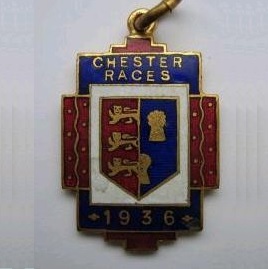 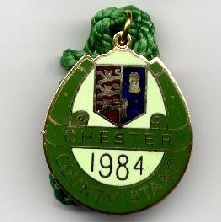 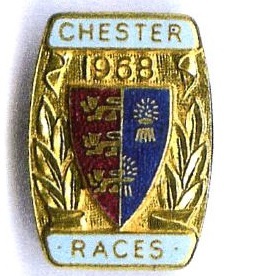 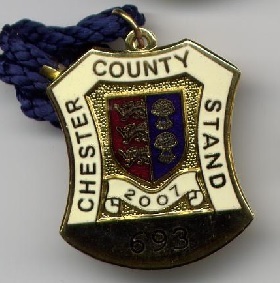 This meant that smaller courses could not compete, but also forced Chester to increase the prize for the Corporation Plate (later to be called the City Plate) to £50. 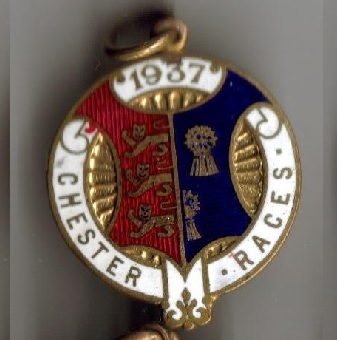 In 1813 the inaugural running of the Dee Stakes was won by Sir Watkin Williams-Wynn, with result shown below, while in 1824 the Chester Cup, known in its earliest days as the Tradesman’s Cup, was contested for the first time when won by the 6 year old Doge of Venice carrying top weight. 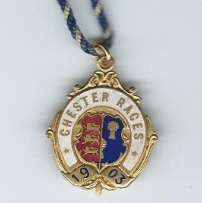 His owner, Sir Thomas Stanley, was triumphant again in 1827 with Grenadier. 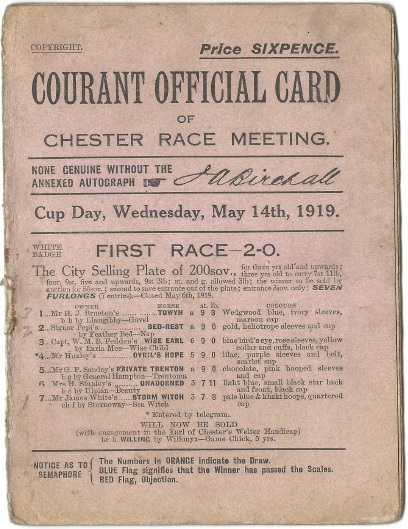 The Chester Vase was first contested in 1907 and resulted in a dead heat. 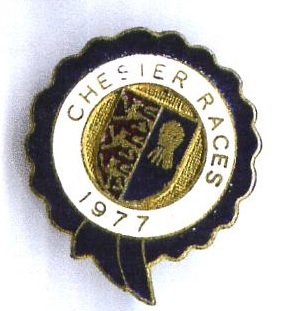 It is now used as a classic trial because Chester’s left handed turns mirror those experienced at Epsom. 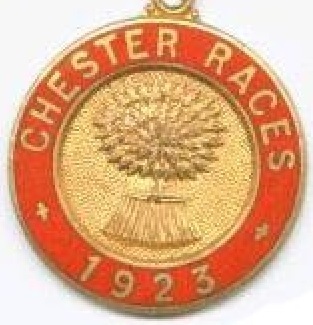 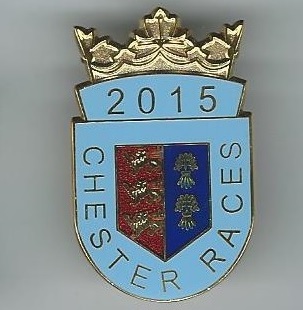 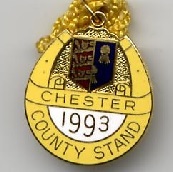 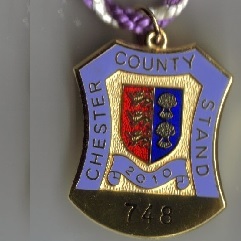  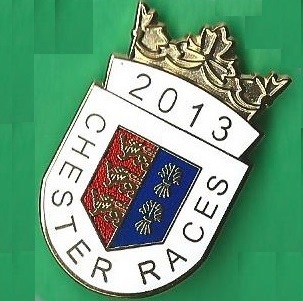 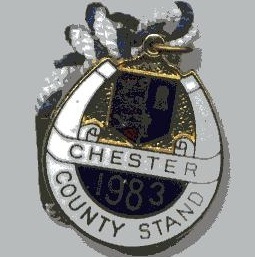 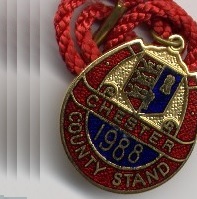 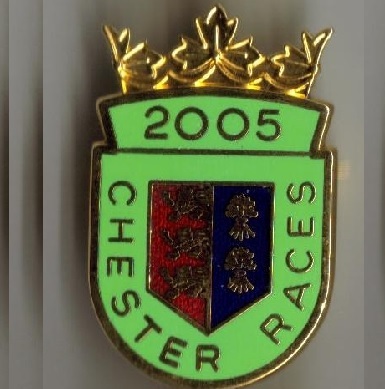 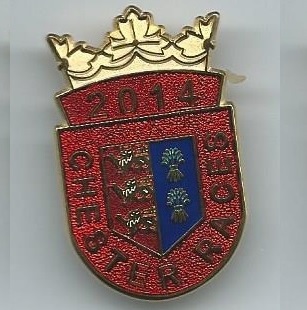 Currently Chester offers 15 magnificent fixtures annually. 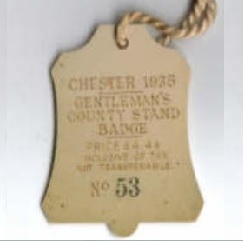 With grateful thanks to Tony Jones (Chester) for providing the scan of this rare ticket. 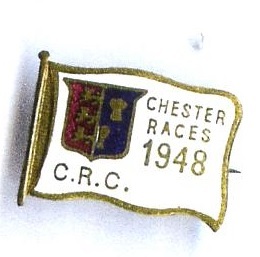 With grateful thanks to Gerald Tinsley for the share certificate. 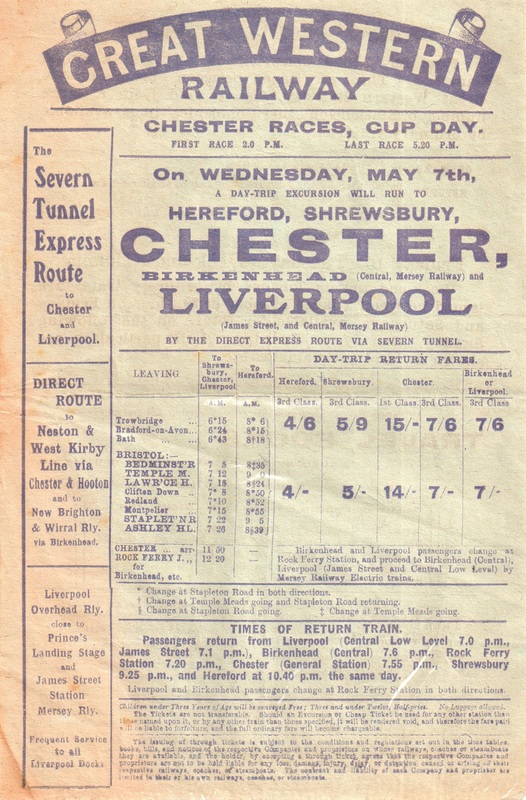 Chester continues to thrive today, whereas nearby Tarporley closed its gates for the final time in 1939. 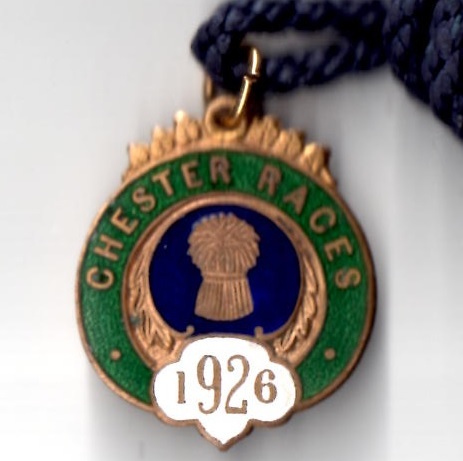 Tarporley Racecourse first witnessed racing on Tuesday 5th November 1776 when administered by the Tarporley Hunt Club which itself had been founded in 1762. 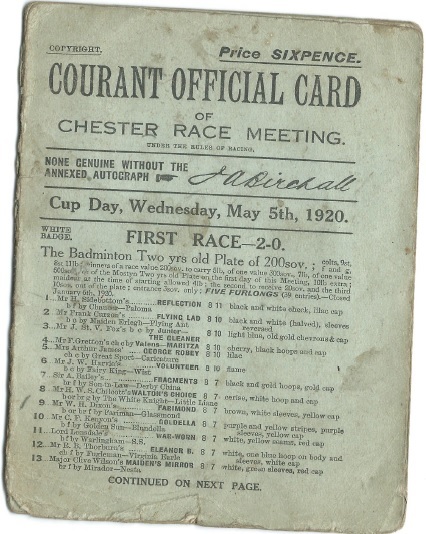 The highlight of each card was the Tarporley Hunt Cup which went to the Earl of Stamford on Tuesday 5th November 1782 with his mare Diana. 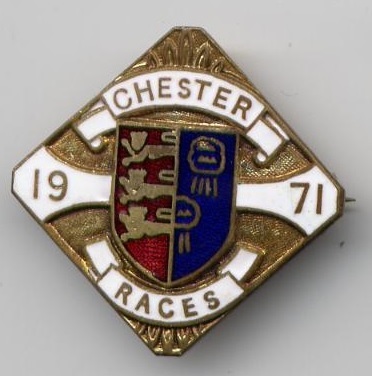 This early period of racing is known to have taken place at Crabtree Green, near Delamere, on land owned by George Wilbrahim and lasted until 1783. 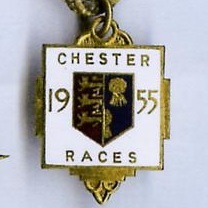 It was re-established 6 years later, while a Silver Cup race was introduced in 1805. 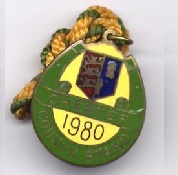 Almost exactly 39 years after the first meeting was staged the last took place at Crabtree Green in November 1815. 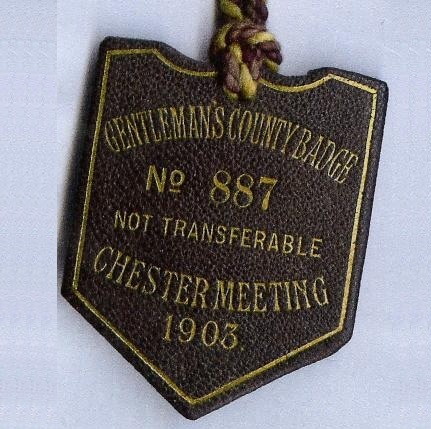 The meeting transferred to Billington Training Ground for the two year period 1816 to 1817. 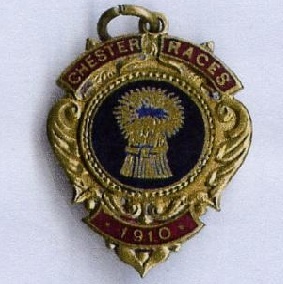 Racing continued, on and off, at a number of venues in the area, notably Oulton, Cotebrook and Saighton Farm from 1875 to 1876. 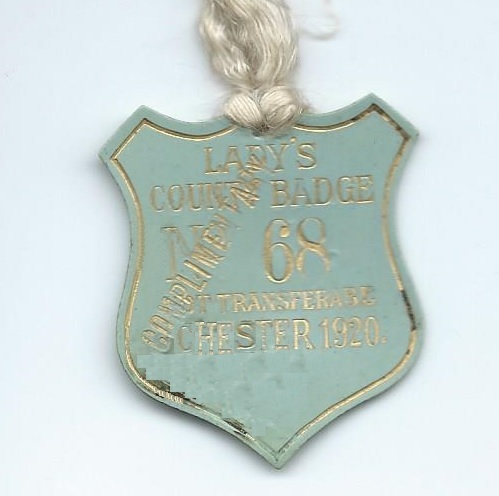 By 1877 the Tarporley Hunt Steeplechases were established on the Arderne Estate and continued to be well supported annually. 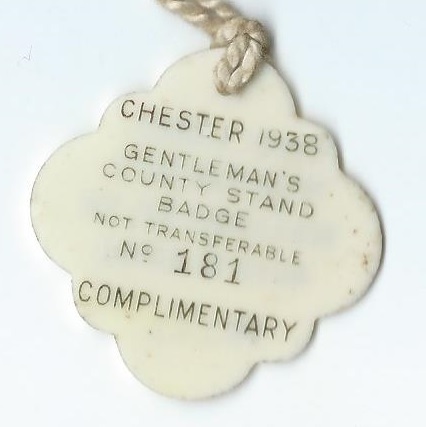 In 1930 a tote was introduced at the course, and such was the appeal of the racecourse that in 1937 a grandstand was built. 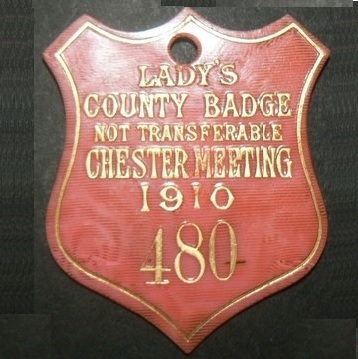 When a meeting took place on Wednesday 26th April 1939 little was it known that it would be the last to be held. 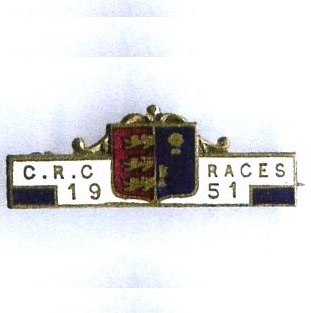 The course was taken over by the MOD during World War 2 and a prisoner of war camp erected. 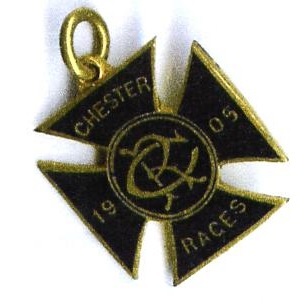 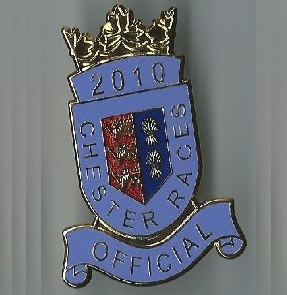 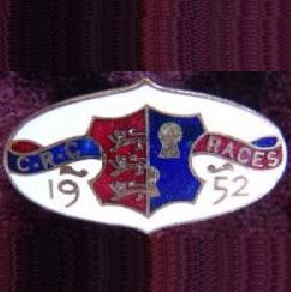 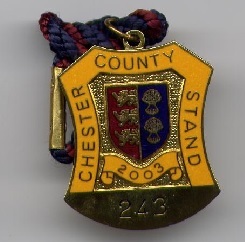 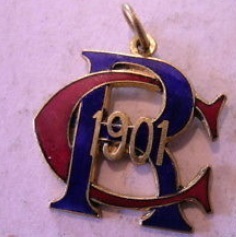 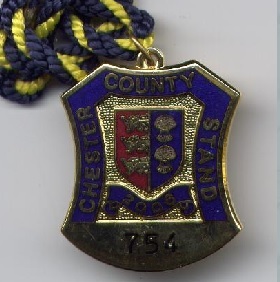 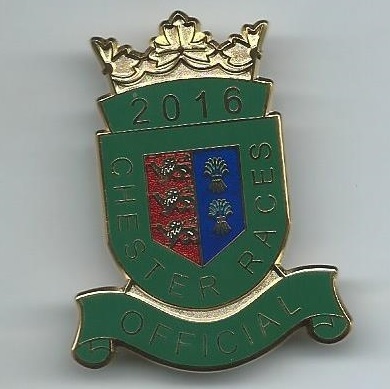 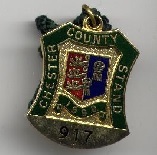 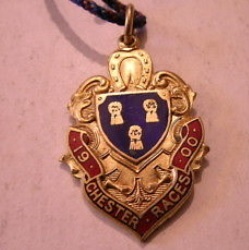 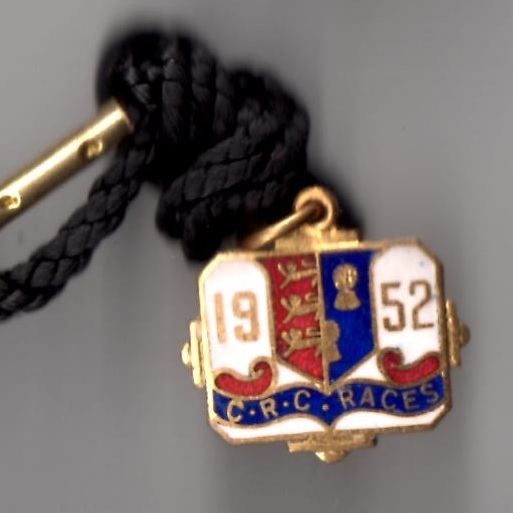 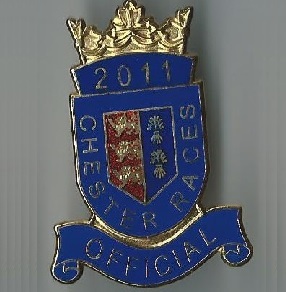 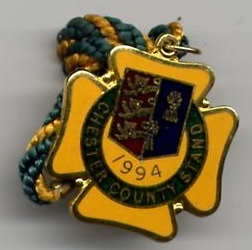 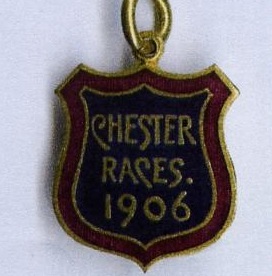 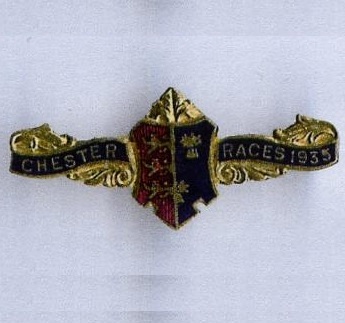 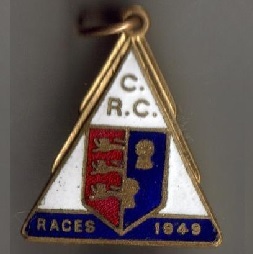 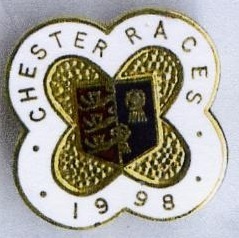 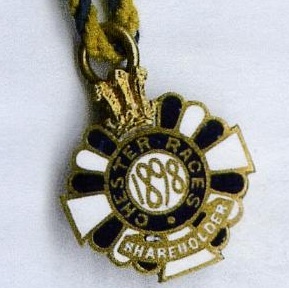 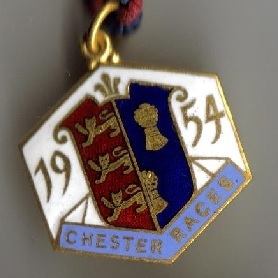 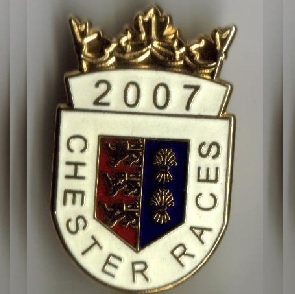 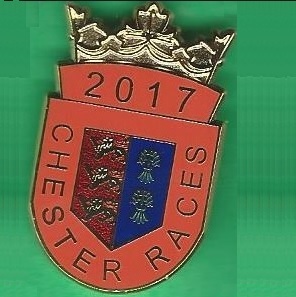 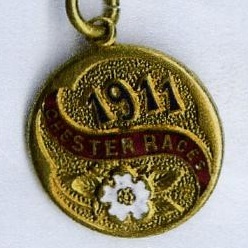 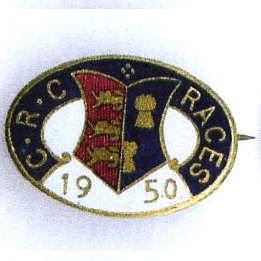 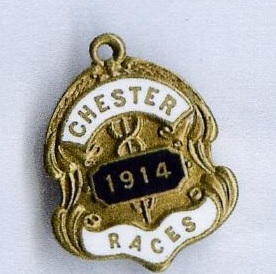 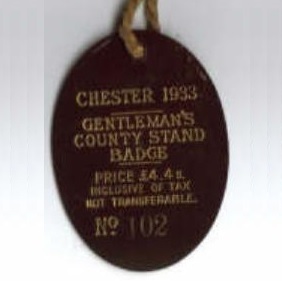 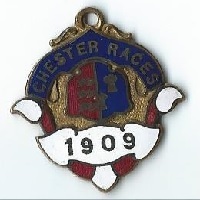 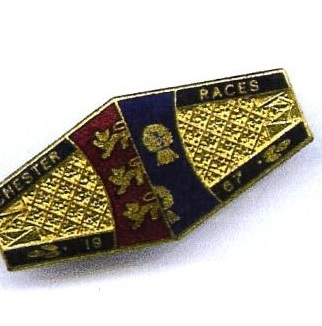 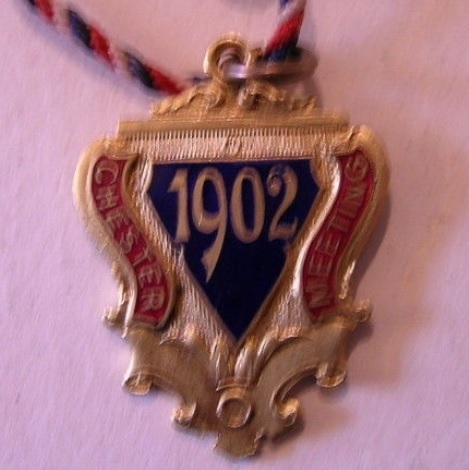 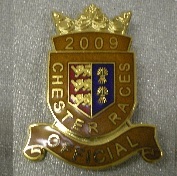 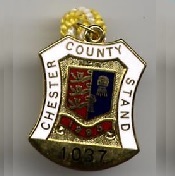 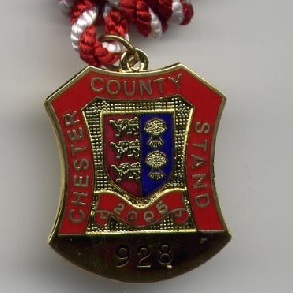 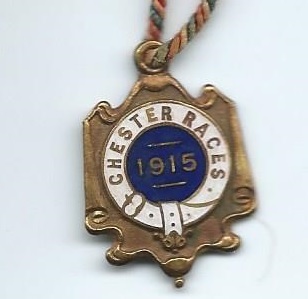 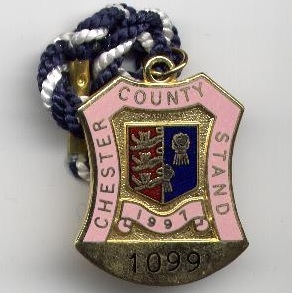 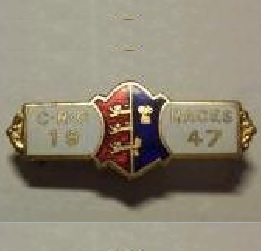 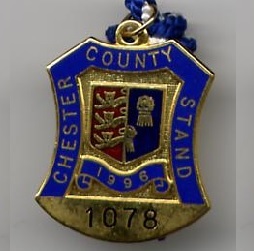 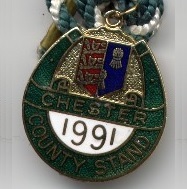 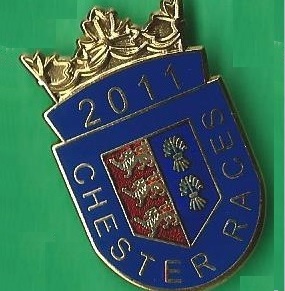 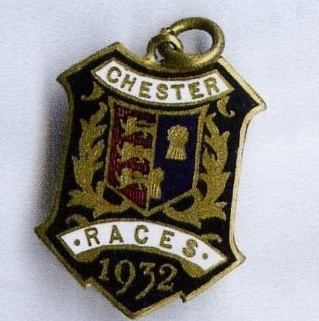 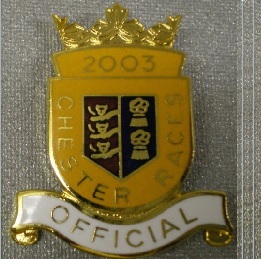 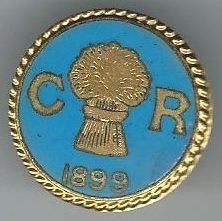 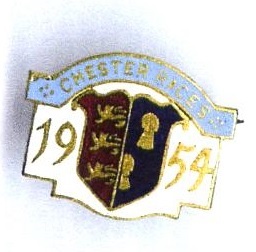 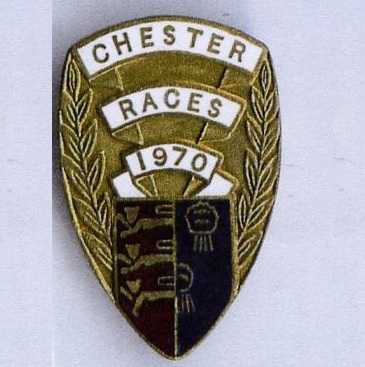 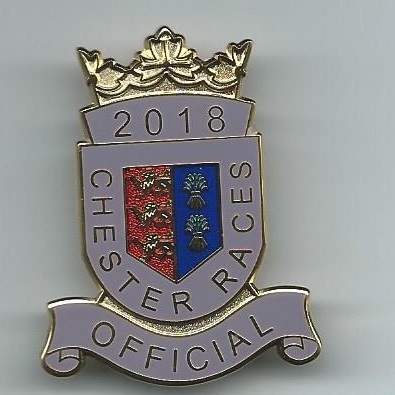 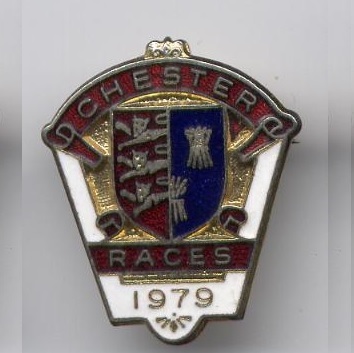 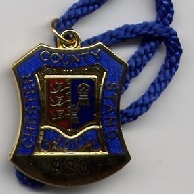 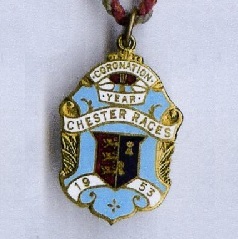 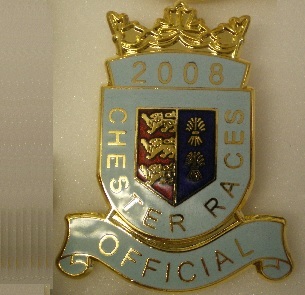 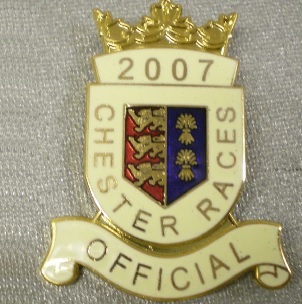 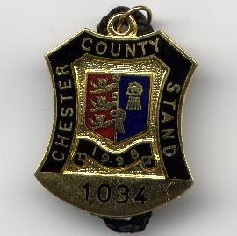 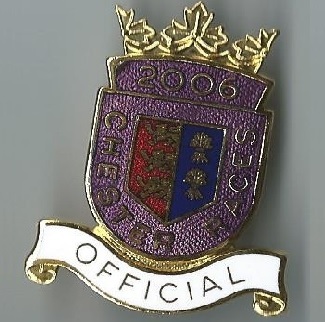 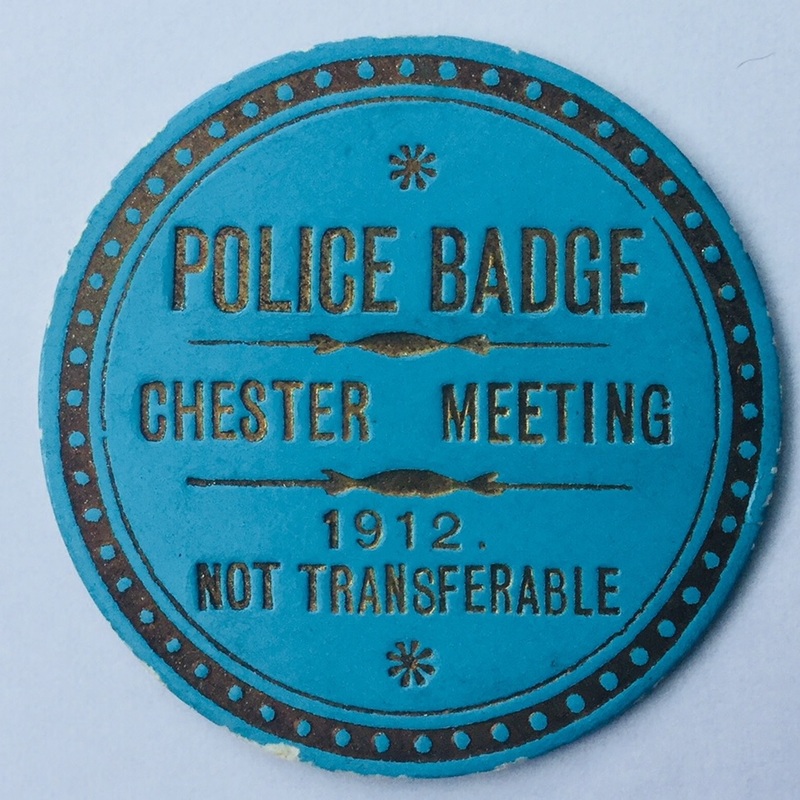 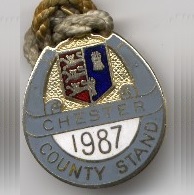 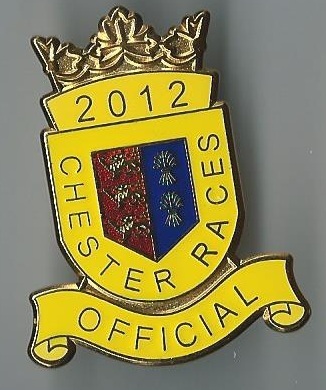 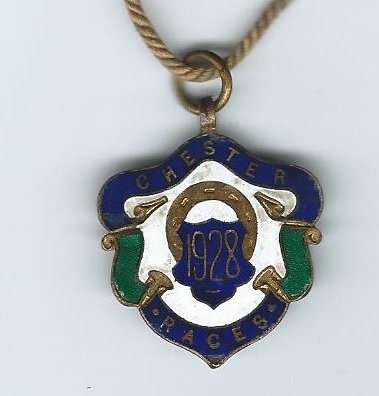 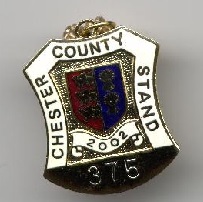 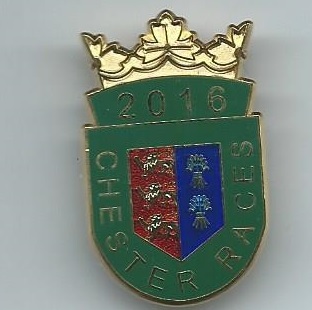 The very rare badge opposite is shown courtesy of Nick Redman and was worn by a Police Officer at each Chester meeting held in 1912. 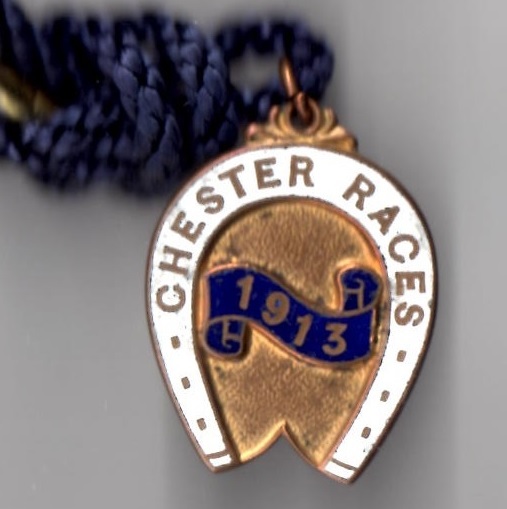 The meeting on Thursday 9th May 1912 marked the centenary of the Dee Stakes (£500) over 1 ½ miles. 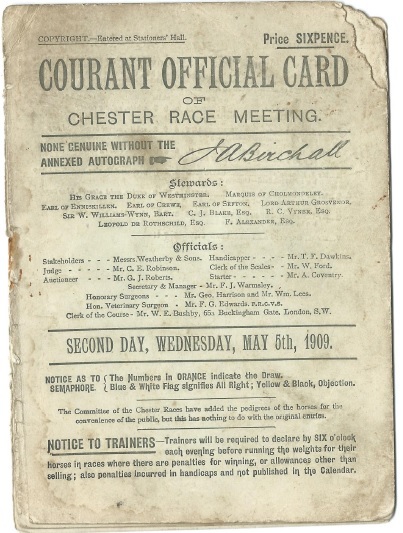 The famous Ormonde Stakes, contested on the same day, was won by the Duke of Portland’s Amerongen, beating fillies by Isinglass and Soliman. 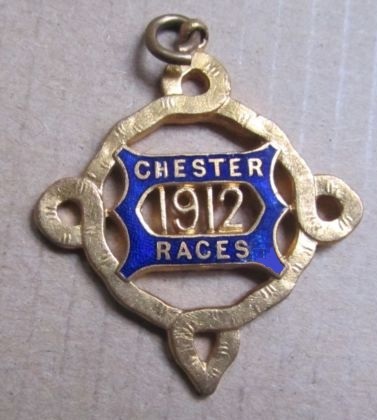 With very grateful thanks to Barry Sutton for the superb, very rare scans Chester racecards from 1919 and 1920 when the Chester Cups were won by Tom Pepper and Our Stephen. 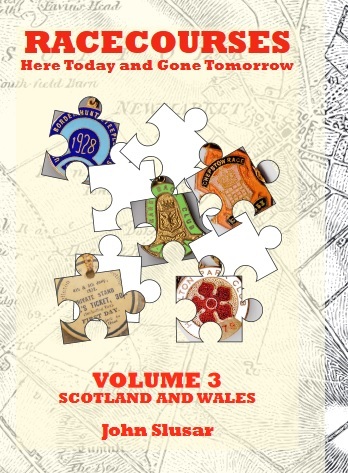 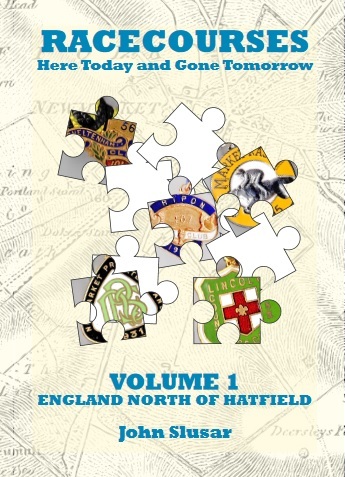 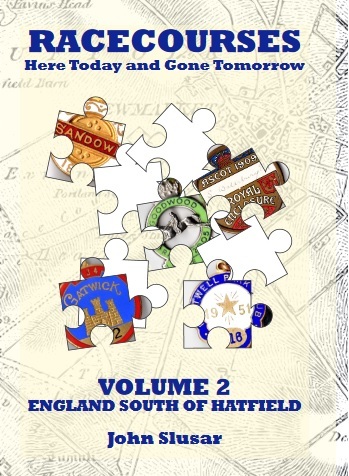 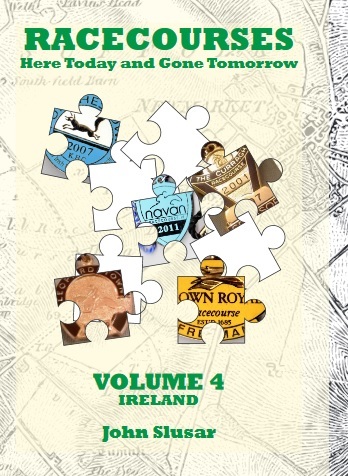 With grateful thanks to Barry Sutton for the majority of the badges shown on this page.